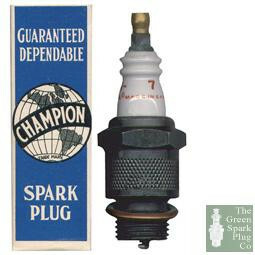 Spark Plug Champion 7 Genuine old stock Circa 1944. New unused, good condition with a slight bit of verdigree on the brass top screw, and very slight rust in places on the black body parts. (non on the threads). 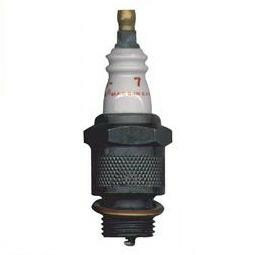 These old plugs are manufactured from a better conductive material than their modern counter parts. 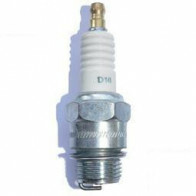 So helping your engine to start easier and run more smoothly. Recommended by Champion for the following vehicles: Alfa Romeo to 1934 touring, Armstrong Siddeley to 1933, Austin, Austro Daimler to 1930, Bentley to 1932, BSA, Buick to 1930, Cadillac, Chevrolet, Chrysler, Citroen, Crossley to 1933, Delage to 1933, Duesenberg, Essex to 1933, Fiat (Except 509 sports), Ford, Hillman to 1934, Hispano-Suiza, Humber to 1931, Jowett, Renault, Riley 12 h.p. tourer to 1929, Rolls Royce, Rover to 1933, Singer, Sunbeam to 1931.